Since Alexander Technique teacher training is often Sturm und Drang for me I think it best that I should really try lighten up there more often. My usual leitmotif… I do so more easily in other walks of my life. So what if Alex Tech training brings up so much stuff from one’s past…eh…whatever… I should think of training as a comedic play. Molière anyone? I think it would be great if I could make a major effort to be as light and fluffy as much as possible in training, even if I feel like being silent with seriousness. I have been accused of being too serious often enough in my life. Well, I can act the part, right? Better I should think Molière rather than Racine, right? We finished reading FM’s Man’s Supreme Inheritance in training, and then had an impromptu discussion on the fate of the Alex Tech and if it can possibly change the world. It is so rarified…unlike yoga, for example, which is so mainstream these days. We went way over time what with talking about it all… An interesting discussion for me…as I plod along on my particular journey of this learning process. Well I am undergoing the training for me alone…I figure that I owe it to myself. Even if I were never to teach one lesson. I got to thinking…well…there are 4000-ish teachers of the AT worldwide and 200 concentrated in NYC. Will there be a market for me? I do hope that some students will find me! But…after all…as I say…I am undergoing this painstaking process because I owe it to myself to do so. 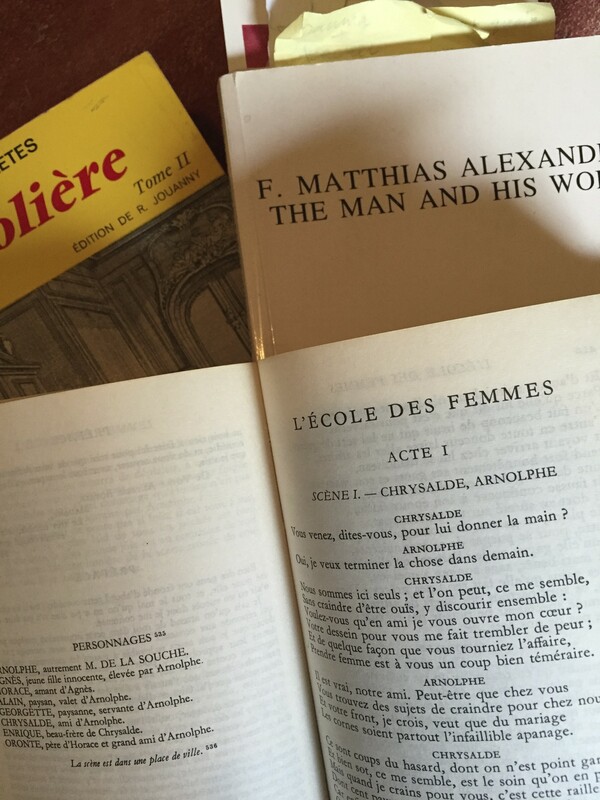 Our next up reading is Lulie Westfeldt’s F. Matthias Alexander: the Man and his Work. It’s kind of timely for my re-read of this. I have a different take on it this time around. It’s proving to be a real eye-opener. It is a very, very personal read to me. And, it does seem like she is describing the Alex Tech world of today…and not FM’s first training course. Plus ça change, plus c’est la même chose. Sad but true. As I read more of her book, I understand my training more and more. So the latest training news is that for the rest of my second year I’m to work in giving 10-minute turns, both table and chair, to my co-trainees, while figuring out what they need from/with my hands-on. This is a nice thought. I guess it means that my sensory perception is getting more reliable. Yvette, j’ai le fou rire! “Bof!! !” alors! Mille fois merci! C’est parfait!